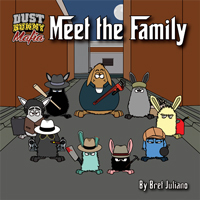 The Dust Bunny Mafia is back with a brand new short story in addition to the current story arc. “The Flightless Canary” can only be found in a short story anthology, Forgotten History, which is currently seeking funding on Kickstarter right now! 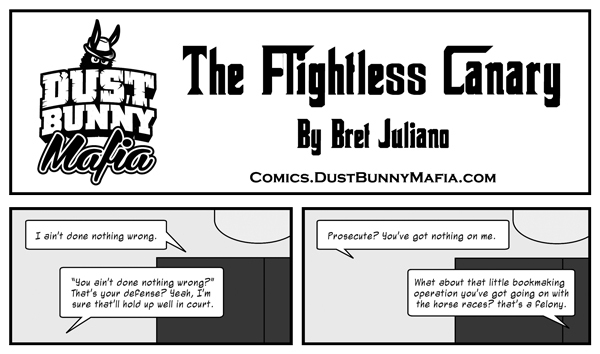 See a preview of the short story below. As a special treat, I’m also offering a very limited commission opportunity for someone who pledges $65, to receive a fully customized Mobimal: mobster animal of their choice, created by yours truly. As of right now, the Kickstarter is about 46% funded and we’ve got 21 days left to get the other 54% this project funded. Every dollar counts! Capeesh?! ?